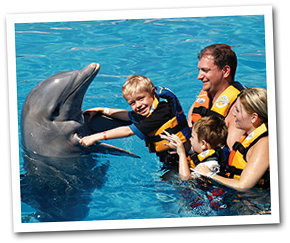 Interact with Dolphins - Perfect for Families! 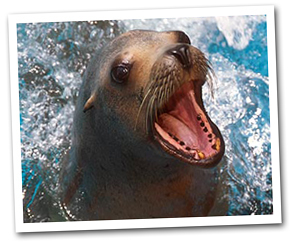 Looking for a fantastic, fun-filled family activity that lets you get close to dolphins in Hawaii? If you are traveling in a group with small children or others who simply prefer to remain in shallow water, then the Dolphin Encounter is perfect for you. This interactive dolphin program is designed for children and groups. 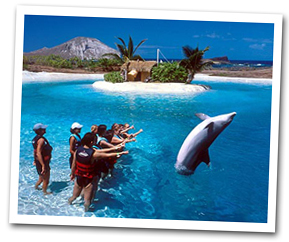 You will learn about dolphins and experience their intelligence and friendliness while having lots of fun interacting with them in our tropical Hawaiian setting. Gather your group and reserve your Dolphin Encounter today. This package gives you the chance to interact with dolphins. It is created for your comfort in the water. From a waist deep platform, participants observe the dolphins while they perform high-energy behaviors. Dolphins play, kiss and even “dance” with the guests! *Schedules are subject to availability. Maximum of 6 guests per tour time. Standard park hours are 9:30 am - 4:00 pm. The last show is at 3:00pm.